James E. Bertelsmeyer Hall was designed by Clark Enersen of Kansas City and constructed by Bales Construction Co. Images coutesy of Missouri S&T News & Events. The LEED rating system is the foremost certification program for buildings, homes and communities that are designed, constructed, maintained and operated for improved environmental and human health performance. 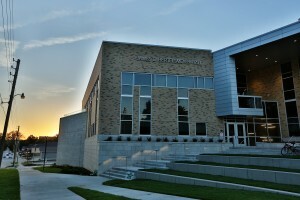 Bertelsmeyer Hall received 56 points and achieved LEED Silver certification for water savings, energy efficiency, indoor environmental quality, site selection, and development density and community connectivity. The building’s scorecard is available online. Designed by Clark Enersen of Kansas City and constructed by Bales Construction Co., the 68,500-square-foot, three-story building — which was officially dedicated last fall — houses teaching and research activities for Missouri S&T’s chemical and biochemical engineering department. The facility’s lower level holds research laboratories and lecture halls as well as space for mechanical and electrical equipment. The first floor houses research and teaching laboratories, lecture halls, offices and student gathering space. The second floor houses research laboratories and office space.